Many organizations continue to blindly blaze into new technology territory without fully understanding the inherent IT risks. 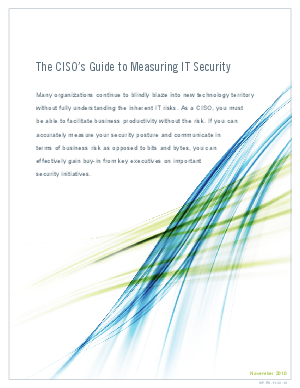 As a CISO, you must be able to facilitate business productivity without the risk. If you can accurately measure your security posture and communicate in terms of business risk as opposed to bits and bytes, you can effectively gain buy-in from key executives on important security initiatives. Learn the key steps to enhancing your security visibility so that you have a voice at the executive table and not just a seat.